Unlike finite element and finite difference formulations, MIGRATEv9 does not require the use of a "time-marching" procedure. MIGRATEv9 uses a finite-layer technique (Rowe & Booker, 1991; Rowe et al, 1994) that provides numerically accurate and stable results, while requiring relatively little computational and data entry effort. In addition to advective-dispersive transport, MIGRATEv9 can consider sorption, radioactive and biological decay, and transport through fractures. 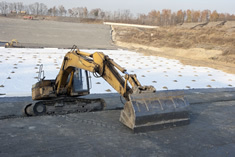 One or more landfills, buried waste, spills, or disposal ponds can be modeled. These contaminant sources may be adjacent or offset from each other. Model properties may be either constant or transient, with the concentrations calculated at specified times, depths, and distances. MIGRATEv9 is a DOS program that can be run in a Windows shell. The program supports a limited number of printers and screen resolutions. Model multiple contaminant sources, for example to represent landfill extensions. Vary properties with time, to simulate such effects as the failure of engineered systems. Simulate radioactive or biological decay. Include 1-D, 2-D, or 3-D fractures in any layer. Simulate secondary leachate collection systems using a passive sink in any layer. Model contaminant sources as surface boundary conditions or as a physically buried layer. Have the source concentration deplete with time or remain constant. Remove leachate using a leachate collection system. Specify the base as an aquifer impermeable, or zero concentration boundary condition. Specify both horizontal and vertical velocities and hydrodynamic dispersion coefficients for each layer. Model non-conservative species using linear sorption. The following resarch reports explain the use of the POLLUTE and MIGRATE software and can be downloaded using the links below.